Audrey Ruth Schuett Wulfken, age 91, of Salem, VA, passed away on Saturday, March 31, 2018. Born on May 22, 1926 in Melrose Park, Illinois to the late Herbert and Christena McIver Schuett. She grew up near Pontiac, Michigan, and graduated with a B.A. 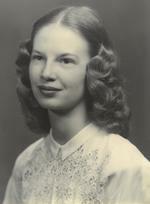 in Math from Albion College in Albion, Michigan, 1947. Audrey worked for General Electric in, Schenectady, New York. Married on July 23, 1949 in Pontiac, Michigan to Howard J. Wulfken of Brooklyn, NY. In addition to her parents she is preceded in death by her sister Abigail in 2007, and her husband Howard in June 1994. Member of College Lutheran Church since 1957 where she served on church council, as a Sunday school teacher, and as a leader in the Bethel Series bible study classes. Life member of VISA Yacht Club, the Salem Library, and the YWCA. Served as vice president of the Schenectady, NY YWCA and as Secretary of the Board of the Roanoke Valley YWCA and cofounded the Salem center of the YWCA. Member of the Elderscholar Program and the Society of 1842 at Roanoke College, the Athenians, and the Taubman Art Museum. She worked, with her husband, many years with the American Field Service. They were sailors and travelers. She was devoted to her books, antiquing, art, architecture, and the study of history. She was a watercolorist. She was a sponsor for the charity Godparents for Tanzania which provides educational opportunities for needy Tanzanians. She called herself a “professional” volunteer but her favorite roles were as a daughter, wife, mother, and friend, but her favorite title was Grandmother to her boys. She is survived by one daughter, Christine M. Post and husband, John of Anacortes, WA; son, John H. Wulfken and wife, Kathy of Medina, OH; two grandsons, ENS Philip Wulfken U.S.N. of Severn, MD and Ian Wulfken of Medina, OH. A celebration of Audrey’s life will be held on Wednesday, April 18, 2018 at 7:00 PM at College Lutheran Church in Salem, VA with Pastor Dwayne Westermann officiating. Friends may visit with the family from 5:00 PM – 7:00 PM at the church.